Contemporary and Modern styled Corner Unit overlooking the waters of San Carlos Bay. 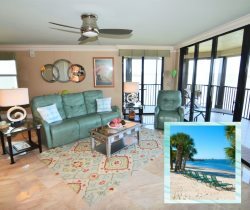 This beach condo for rent in Sanibel Harbor, Florida features a large, top quality TV in the living room, with state of the art electronics throughout, including an upgraded channel line up with a sports package. U-Shaped leather sofa with ample seating and Pub style dining table and bar stools. Master bedroom has a King size bed and the Guest bedroom has two Twin beds. You may have found this rental on HomeAway 4363845, HA ID 4363845, VRBO 4363845, or Vacation Rentals 4363845. This place was phenomenal! I have already referred it to some friends. We would definitely stay here again and would pick our same condo too. The wrap around screened in porch was perfect. Just beautiful!